Ultimately recoverable reserves of 79 Tcf in ten gas discoveries across Egypt, Israel and Cyprus in 16 years define the East Mediterranean hotspot. Israel’s giant Leviathan (22 Tcf). Technical success rates exceed 60%, with commercial rates projected to reach 50%. Gas markets have been secured and production phases entered, with gas from Zohr heading ashore just 2½ years after discovery. Tamar exports via pipeline to nearshore Israeli facilities. 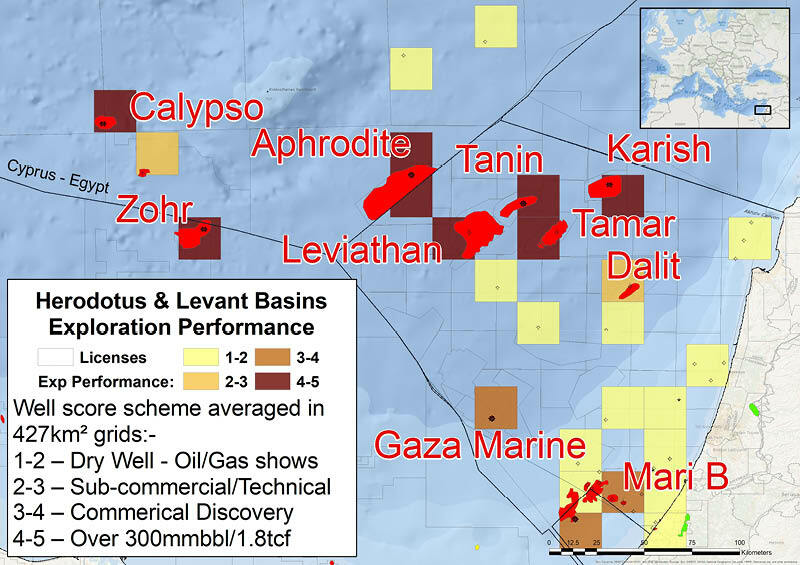 Development plans are in place to pipe gas ashore from Israeli fields Leviathan, Karish and Tanin. No firm plans are yet announced for the Cypriot discoveries Aphrodite and Calypso, although Aphrodite may be routed to Egypt. The Gaza Marine discovery offshore Palestine is stranded. Noble Energy and the Delek Group dominate Israeli E&P, although recent exploration licence awards went to Energean and a new Indian entrant. ENI operate Zohr and have partially monetised it through sales to BP, Rosneft and Mubadala. ENI and Total found the Zohr lookalike 7 Tcf discovery Calypso, offshore Cyprus, following technical success but commercial failure at Onesiphoros West. Attempts to drill Cyprus Block 6 prospect Soupia have been abandoned due to a maritime dispute with Turkey, which has shot 3D itself and identified prospects in the region. Noble operate the Cypriot Aphrodite discovery with partners Shell and Delek. ExxonMobil also have licensed acreage offshore Cyprus. Lebanon’s attempts to extend the Levant Basin play northwards resulted in awards to a consortium of Total, ENI and Novatek but re-awakened a maritime border dispute with Israel. Meanwhile, Greece has announced bids for wildcat acreage offshore Crete from Total, ExxonMobil and Hellenic Petroleum, probably chasing a similar play. The high success rates in the Tertiary Levant Basin reflect seismic DHIs and low risk play elements. Rapid Late Cretaceous deepening of the basin led to the replacement of carbonate-dominated sedimentation by deep marine clastics, including north-east-directed sand-rich turbidite reservoirs from the Nile Delta deposited into shales, generating biogenic gas and forming the seal. East Mediterranean gas, predominantly from the Oligocene, is biogenic, 95-99% methane and has very low condensate yields. Access to source is widespread; up to 800 Tcf of gas is estimated to have been expelled offshore Israel alone, though source is not guaranteed: Eni drilled two dry wells off Cyprus. Locally continuous turbidite fans form high quality Lower Miocene reservoirs with up to 25% porosity, even at depths of 5 km. Hi flow rates per well are a significant factor in commercialising gas at such depths. Traps are structural, commonly large, faulted 3-way dip closures. Interbedded flooding surface shales seal gross columns over 100m high vertically and cross-fault. Crucially, rock physics allows direct detection of gas-water contacts on seismic. By contrast, the Herodotus Basin play features shallow water carbonate build-ups and promontories seeded around the long-lived Eratosthenes High as it keeps pace with basin deepening. Biogenic source rocks onlap the build-ups in direct juxtaposition with older and contemporaneous reservoirs. The carbonates are ultimately killed off by the Messinian salinity crisis. Miocene to Cretaceous reservoirs are thick (430m connected net pay at Zohr), from reefal to lagoonal and tidal flat environments, with high energy facies forming excellent reservoirs. Traps are formed by the morphology of the build-up. A critical factor is the height of the gross column (>600m at Zohr), related to the geometry of the Messinian evaporites seal at top carbonates as they thin onto the Eratosthenes High. Zohr and Calypso are isolated build-ups with large vertical closure, while Onesiphorus West is a promontory to the Eratosthenes High with limited encompassing salt seal and restricted column height. Politicians, geologists, economists and geopolitical stakeholders alike are focused on the future of these world class gas plays. The Weald Basin: Hot Spot or Hot Air? Billions of barrels have been reported to lie under South East England, but how much of it is recoverable?